Edward the Father: Now Edward, to his great credit, wants to give his own children a better life. So he made sure that as soon as they each reached age 7, they started to master a musical instrument. He monitors their grades closely and requires them to play a varsity sport. “All three of my children are on their way to the Ivy Leagues,” he can often be heard saying. Libby the Child: Libby grew up in a loving but large and somewhat chaotic household. The second of six children, she often was called upon to care for her younger siblings. In fact, her opportunities and activities were often limited by her responsibilities in the household. Libby grew up feeling bored, burdened, and frustrated that she was held back from the activities that she knew she would enjoy. Libby the Mother: Now a parent herself, Libby loves her children every bit as much as her own mother loved her. Born rapid-fire, each less than a year apart, her three boys all love soccer and ice-cream. Libby works part-time but manages to schedule her hours so that she never misses a soccer game. Every day she drives the boys from one activity to the next, making sure they stay active, busy, and challenged. In many ways, Edward and Libby are different. Edward was abused, and Libby was not. Libby’s family was large, and Edward’s was not. But in some very important ways, they are the same. Indeed, they are each making a conscious effort to give their children a better life than they themselves had. For Edward, that’s attention and expectations. For Libby, it’s opportunity and activity. In these ways, they are both premium, top-grade parents who no one could ever fault. But there is another factor, unseen and unknown, which unites these two. A factor which has left a profound mark upon them both, and is quietly, subliminally transferring, through them, to the next generation. Edward and Libby are both what I call WMBNT parents. They are both Well-Meaning-But Neglected-Themselves. 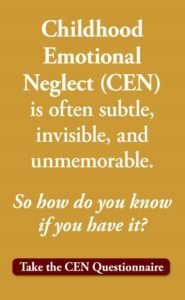 They both grew up with Childhood Emotional Neglect (CEN), and they are unwittingly raising their own children with Childhood Emotional Neglect. As an adult, Edward can remember his mother’s drinking and violence. He can remember his father’s love. But he can’t remember what he didn’t get. So now with his own children, he can correct the things he remembers. But he can’t correct the things that he does not. So Edward does not ask his children those questions, as his parents did not ask him. Libby’s parents were both loving, and there was no abuse. But a very important ingredient was missing from her childhood. As an adult, Libby remembers her parents’ love for her, and she remembers caring for her siblings. She remembers feeling deprived of activities. But what Libby cannot remember is what she did not get. So she does not ask her children those questions either. As she drives them back and forth, buys them ice-cream and cheers for them at games, she fails to notice what they are feeling. She fails to ask them what they need. She fails to see when they are hurt or sad or in pain. And she fails to teach them how to manage any of that. Around and around the circle turns, delivering the numbing, isolating effects of CEN to another generation, and another and another. 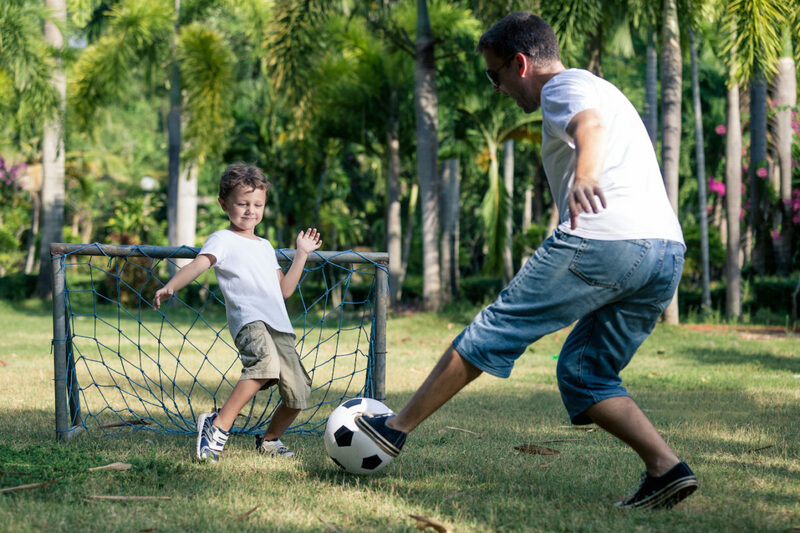 All the while, loving, well-meaning, caring parents work hard, care for their kids, and correct the wrongs that were done to them, unaware that they are failing their children in a most vital way. Unaware that they can reverse the circle. Unaware that they must give their children what they never got themselves. 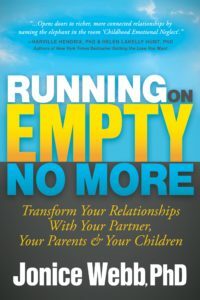 To learn more about WMBNT parenting and how to make sure you don’t pass Childhood Emotional Neglect down to the next generation, see the book, Running On Empty No More: Transform Your Relationships With Your Partner, Your Parents & Your Children. Thank you for this rich work! I’ve written down those questions, as I parent my two children. I am just so, so grateful for those of you doing this illuminating work. Through MBSR course, Al-Anon and reading of your work and a few others, I have really experienced a profound shift in my life. Now, the narrative around WHY my parents weren’t able to give me what I needed is not so personal, so fraught, so painful. I am learning to re-parent in a way that feels true and nourishing. I am just in awe of how much things can truly shift. What a gift to my children as well to do this healing work. Such a gift, the tools to heal. It can be so messy, and so painful, but on the other side is a new landscape. My mum tried care me when dad wasn’t around or chasing her to get out on road make cash for him. He finally noticed I existed when I was twelve and my body started to develop curvy. He started sending me to work with mom selling and treating me as his girlfriend. That is terrible Shyra. I am very sorry that happened to you. I hope you will talk with a therapist about this traumatic childhood experience. My mother was depressed from the neglect in her own upbringing and her marriage to my father. She was an alcoholic, something my family never acknowledged and I didn’t until long after her death. 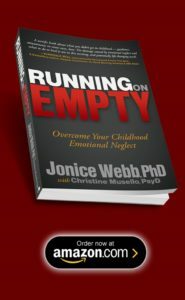 Reading Running on Empty at 58 yrs changed my life and understanding of self. I “see” my self and my family of origin differently. Now I’m wondering if I was as successful at breaking the cycle for my own children as I’d thought. I guess I’ll ask them! communication in all areas of my life. I always felt extremely different from my classmates. I became extremely rebellious when I hit 13 years of age. I suppose that I was desperately looking for the attention that I never received when I was younger. I would find myself involved in all of the wrong male relationships during my lifetime because I was so afraid of being alone! I can remember when I was an infant in my crib, and being so terribly afraid of what would happen to me if/when they passed away! I don’t know why I felt so afraid of being alone in life! I have an issue with TRUST in everyone these days. When my Grandparents died, I was devastated. I miss them both so much, even though I didn’t get the emotional support that I should have been given!